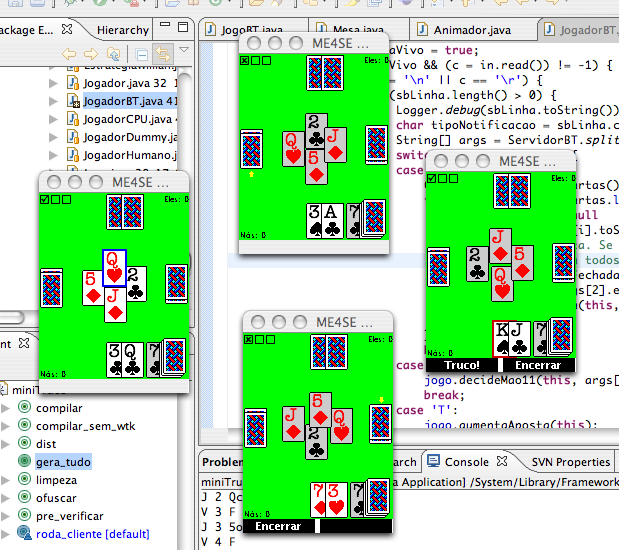 miniTruco is an open-source implementation of Truco Paulista (a very popular card game in Brazil) for Java-enabled mobile phones. It can be played standalone, or in groups of up to four people (using Bluetooth or GPRS). You can also play it on your browser, using the gadget on the right side of this page. The original source code was created by me (Chester), but it is available as free (GPL) software. That allowed several developers to add new strategies and features. Please use the following URL to link to this page: http:/minitruco_en. You can also download it directly on your mobile by navigating to m.chester.me (with a WAP-enabled browser). miniTruco is dual-language (Portuguese and English). If it does not start up in English, just choose the English option on the menu. 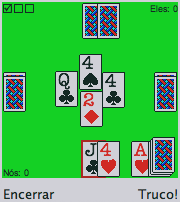 The rules of the Truco card game and instructions to play are available on the Help menu (the links display the text available on the game). The game is licenced under the General Public License (GPL) version 3 (credits and copyright). Its source code is available on Github, but comments and Javadoc are currently in Portuguese. Game being played on the emulator (big and small screens). Multiplayer game running on the emulator.